This is the part in our Icelandic tale where things take a turn. Following our epic snorkel adventure, Aaron was super drained and not feeling great — honestly that happened from time to time for both of us on the trip, especially as it was winding down. Sometimes it was hard to sleep or we were just exhausted from planning too many things. Whatever. Drained and not feeling great occasionally is part of the RTW deal, but still oh-so-worth-it! As we walked into town to pick up our big, blue, puffy coat and boots rental for our next adventure, an overnight tour of all things cold and icy, Aaron started sporting a certain shade of gray that you don’t normally see in humans. He decided to head home to rest while I followed a little while later like Santa with our rental gear in a big garbage bag over my shoulder. I was sure he’d feel better after a nap, but to be on the safe side I stopped for Tylenol and ginger ale on the way home. When I arrived Aaron had a big whoppin’ fever. The kind that sizzled when I put my hand on his forehead. The verdict was in. We were grounded! What a trooper…still smiling inspite of the fever and cancelled plans. That’s my fella! Queue the sad music just as giant flakes of snow started to fall. I cancelled our tour of All Things Cold and Icy. Aaron cozied in with a book. We were thrilled when we learned we could just stay right in our room at the guesthouse and the girls in the reception area asked about him every time I ran downstairs for a cup of tea (everyone loves Aaron!). This was the first time on the whole, entire trip we had to cancel something due to illness! True! Felt super lucky that this would be the worst we experienced over the whole 15 months. In other words, no big deal. Sorry Mid-West family — we haven’t seen much snow in a long, long time. 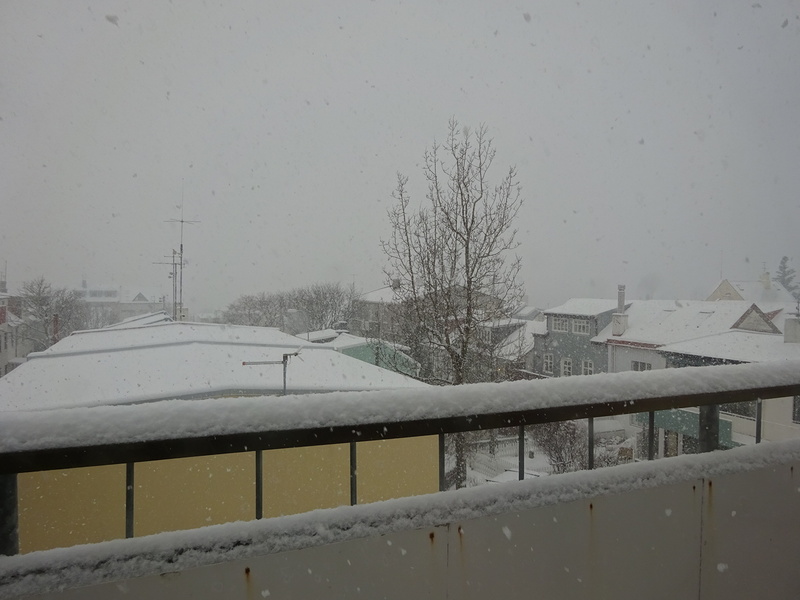 It snowed for days…the big fat Charlie Brown flakes and we watched it from our room while Aaron convelesced. 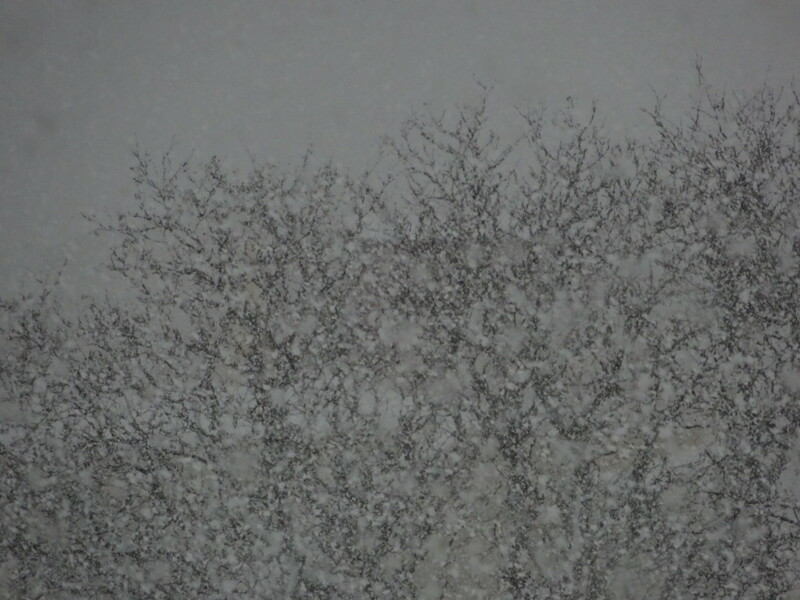 Snow Day from our room. 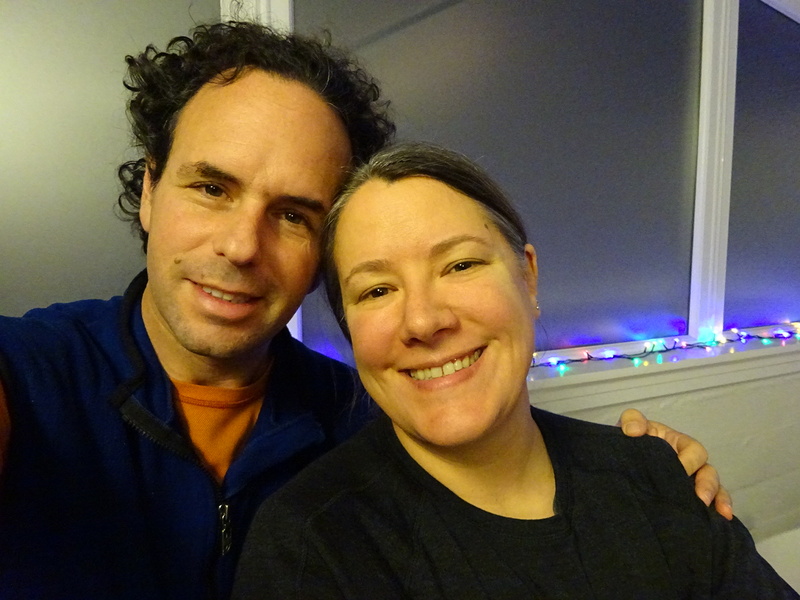 That evening he started perking up – thank you, Tylenol! I got him a couple cup-o-soups and in a few days he was good as new. 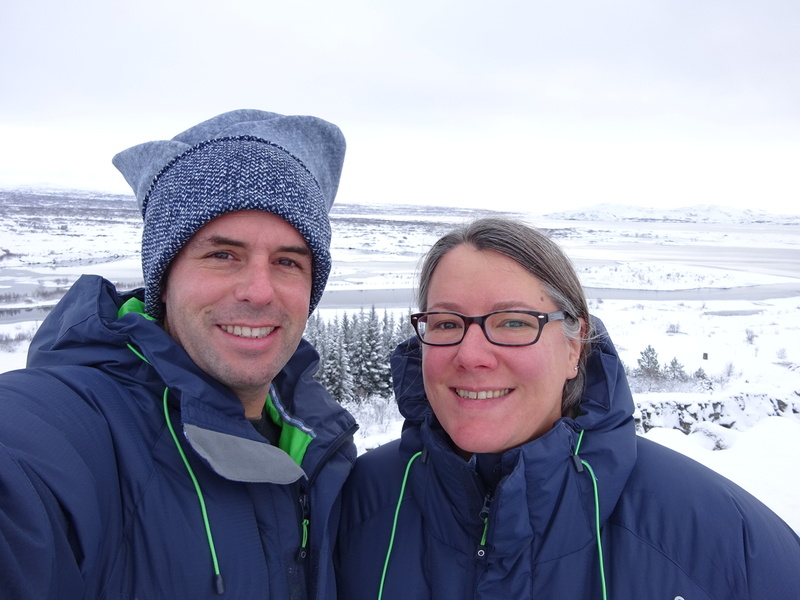 Iceland went from lots of adventure to lots of recovery time and that was a-ok. By the time he was fully healed up, we would only have one full day left in Iceland so we wanted to find a way out of town, even if only for a short bit. This was Iceland, our grand finale, and we were not giving up to sickness that easy. No way! 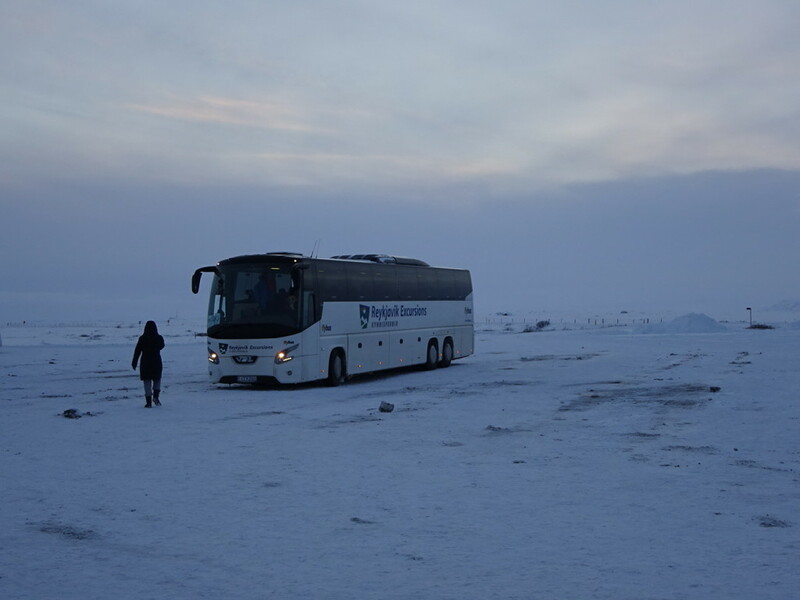 Instead we booked a half-day tour of the Golden Circle. Honestly never thought I’d let myself get on this kind of tour bus before my seventieth birthday, but sometimes plans change. Quite unlike the way we normally enjoy travelling, but it was our best option. Truly, it was more like the only option we had left. We suddenly found ourselves on a giant (HUGE!) tour bus with maybe 60 other people, including (I’m sorry to say) some really obnoxious Americans including (gasp) Seattlites!!! Oh, how can that be true!? Lots of old people complaining that they want better seats on the motor coach. (Really? How much better/worse is row 5 compared to row 25 when you’re getting off at every stop anyway??) Inside I was screaming, “shut up you ungrateful farts…you don’t deserve to be on a tour!“, but I just kept that in my head. Aaron and I were really quiet, hoping no one would think we were like those people. Yep, we were on a much different tour than we were used to. Thingvellir National Park. Add this to our list of UNESCO world heritage sites visited. Wonder how many that is now? Anyway, it was a spot overlooking where we snorkeled a few days earlier. So the deal is that there are seven really super major plate tectonic seams on planet Earth. There are a few more, but these 7 make up about 94% of the globe’s surface. I remember learning about this in school and thought it was fascinating then, but I never imagined you could actually see it. 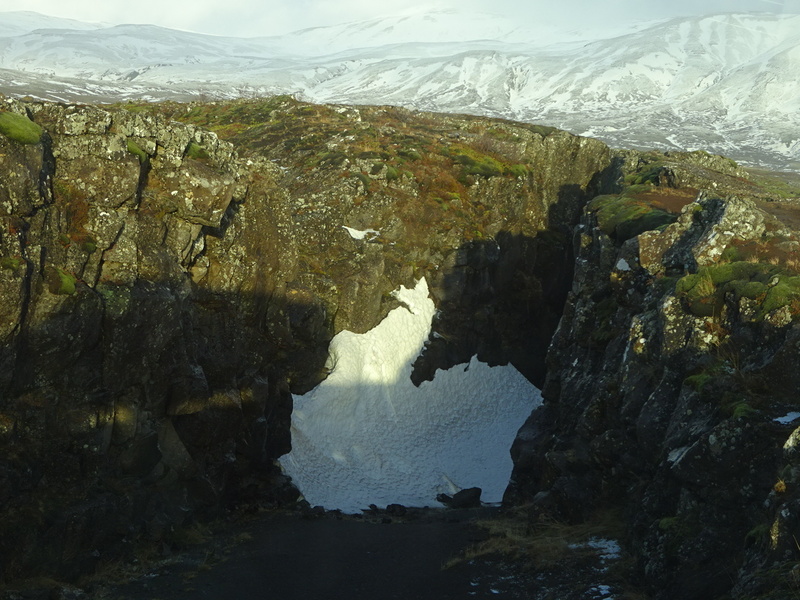 In Iceland you can see the seam! No, really. The land is really flat and full of cracks and then BANG it goes straight up, or straight down depending on where you are standing. 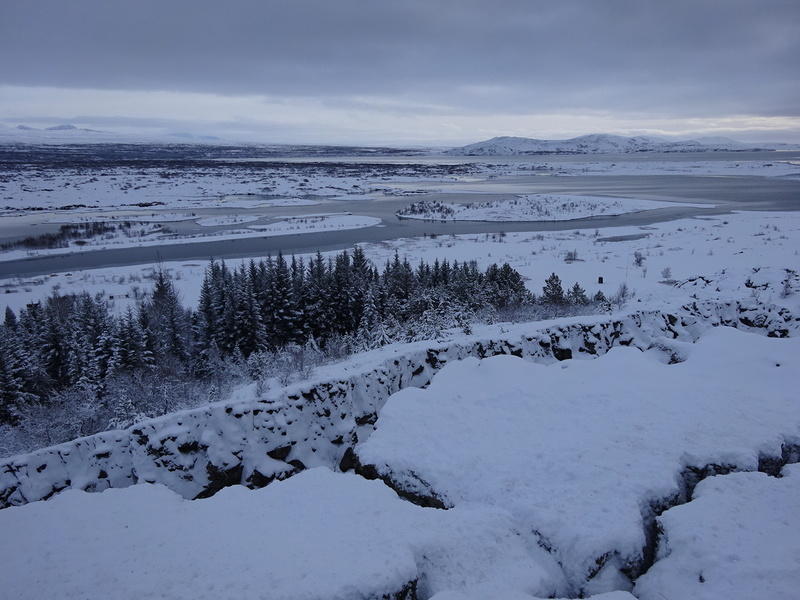 On this tour we drove to a view point to see where the Eurasian and North American plates collide. This is seriously cool stuff and quite beautiful. Beautiful, eh? You can kind of see that the land is all cracked. And that water? That’s where the snorkeling happens. And those mountains in the background? I’m pretty sure they are on a different plate than the one I stood on to take the photo. Cool. 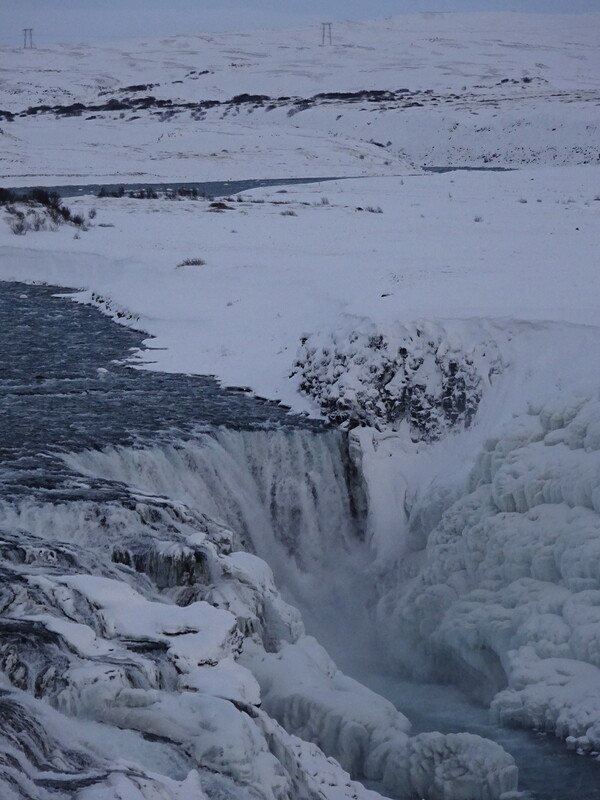 That crack to the right is one of the spots where the plates are separating – don’t fall in! I want this jacket. We rented it from Gangleri Outfitters and it was SO worth it! 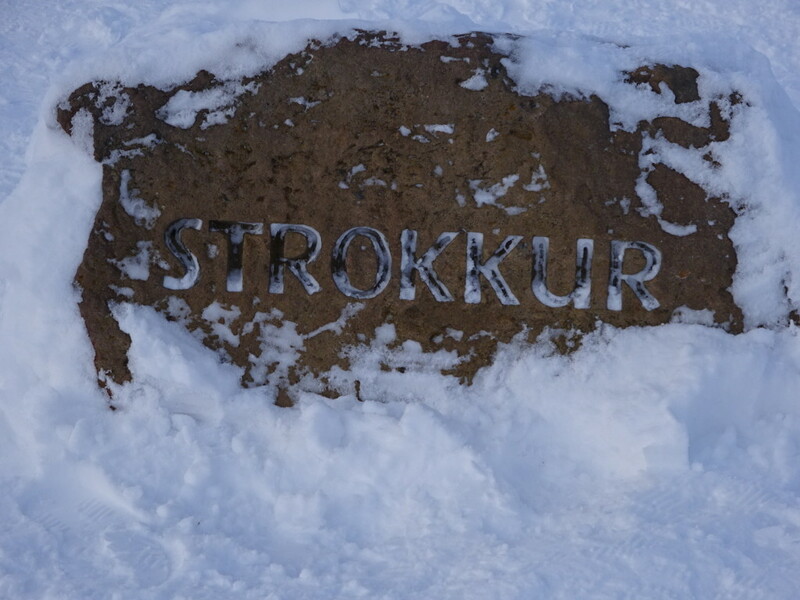 Strokkur geyser was up next. Iceland is just full of geo-thermal-ness everywhere. 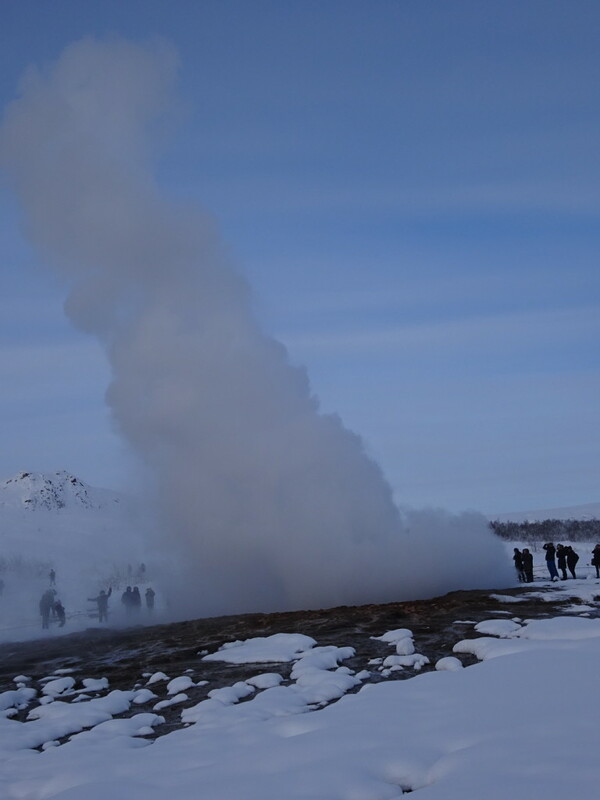 A bit like Old Faithful, Strokkur geyser blows off steam up to 100ish feet high on a fairly predictable timetable. It being freezing cold out, all the steaming water shooting up makes quite a scene! We stood and watched it rise about 4 times with it’s pool bubbling below in-between bursts. Because Iceland has the tourism thing all figured out, the road goes right past the geyser along with a big rest area complete with cafe, bathrooms and gift shop to warm you up. Much appreciated, Iceland! 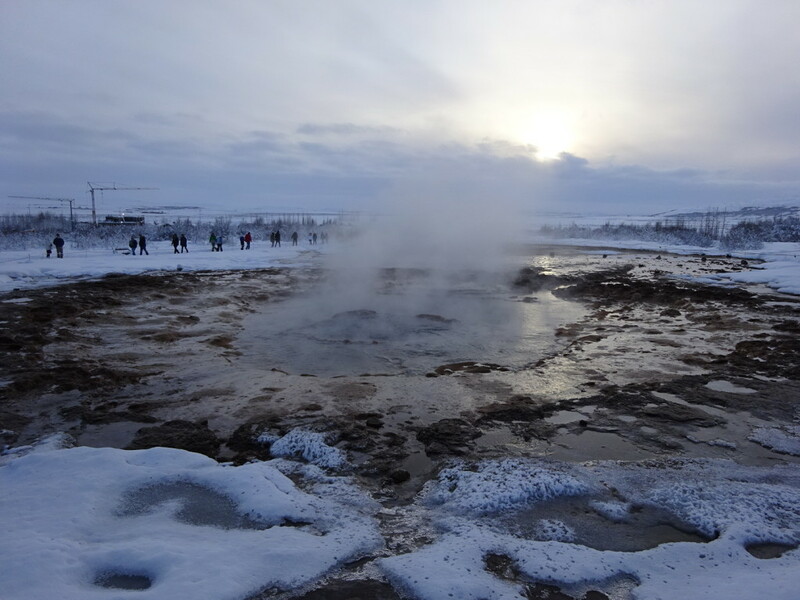 Geothermal energy provides nearly 90% of all heating and hot water in Iceland. The hot water is pumped directly into houses so when you shower it’s smells a little bit sulphury. Fascinating engineering fact: the hot water is pumped many miles to the houses, but only loses about one degree of temperature in its journey. Talk about efficiency! Iceland hopes to be 100% fossil fuel free in the not too distant future…how great is that? 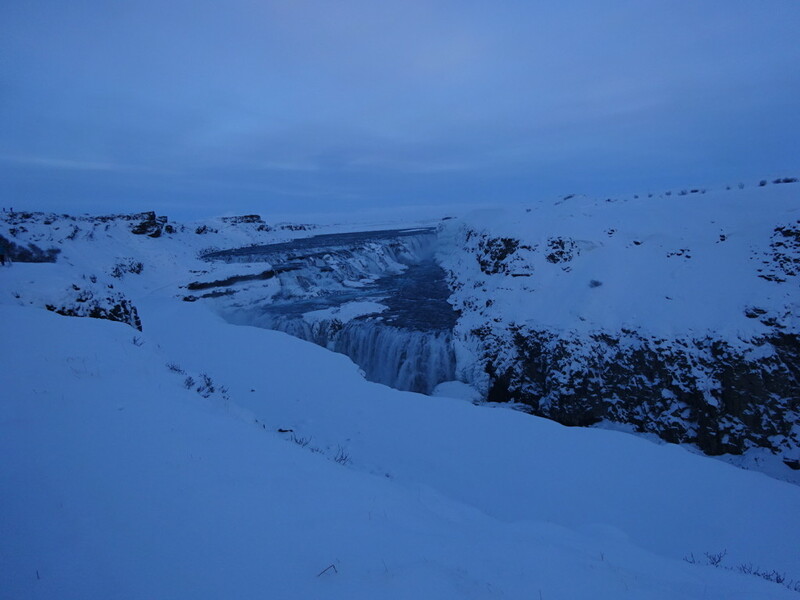 Our last stop of the day was the giant Gullfoss waterfall. About 100 feet high with several drops and multiple falls, these are some pretty badass waterfalls. The spray freezes at the sides making its own stalagtite type of natural sculptures. It was awesome to see, having never been to a big waterfall myself. Thanks, Mother Nature. The lumps on the right side of the photo is ice forming from the spray. 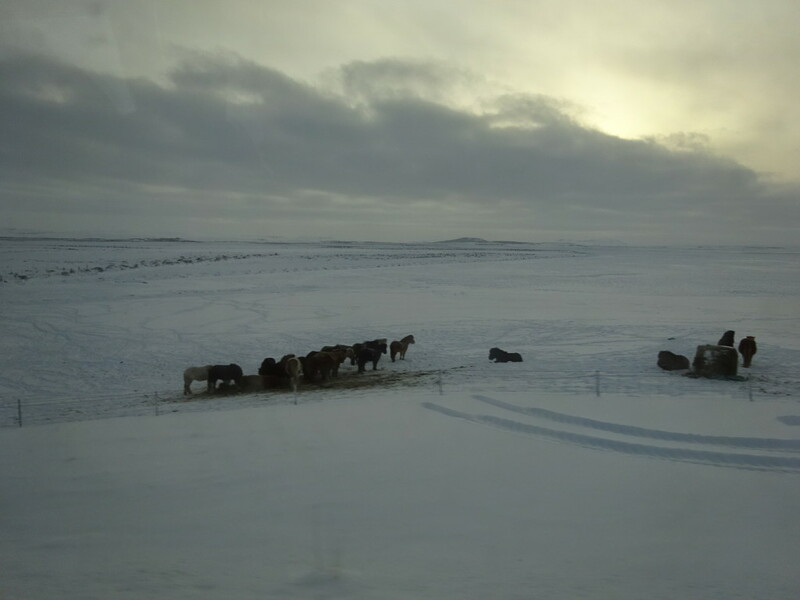 On the way back we had a surprise treat, seeing Icelandic horses! Ponies! I mean, horses! 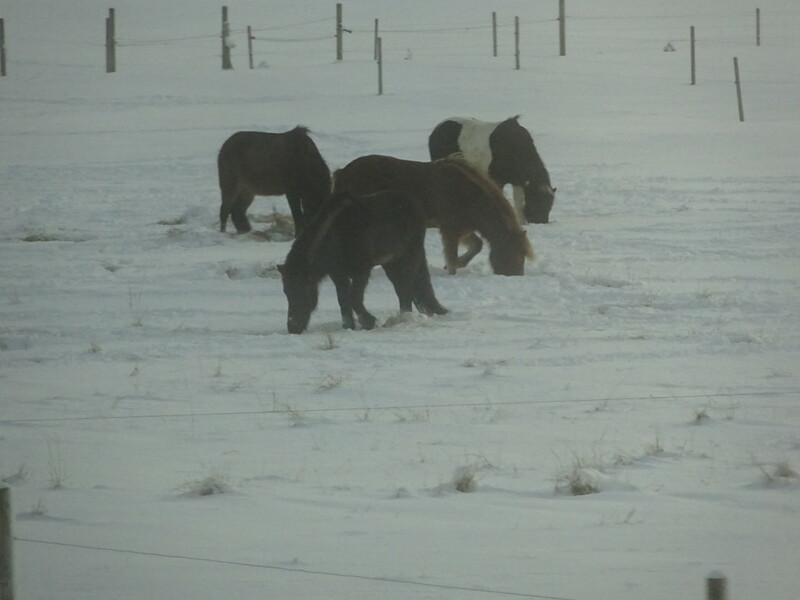 We thought Mongolian horses were little, but these are even smaller. Iceland likes its little horses and you can sign up to go horseback riding if you like. Already having snorkeled in the freezing cold, we decided we could wait for warmer climes to go riding. Herd of ponies…I mean horses. Just a bit out of town. Suddenly our Iceland adventure was complete. Unbelievably the next stop was the US of A! America! Boston…where the adventures continue on! And then it was time to pack up and head on…. « Every Day is a Good Snorkel Day! 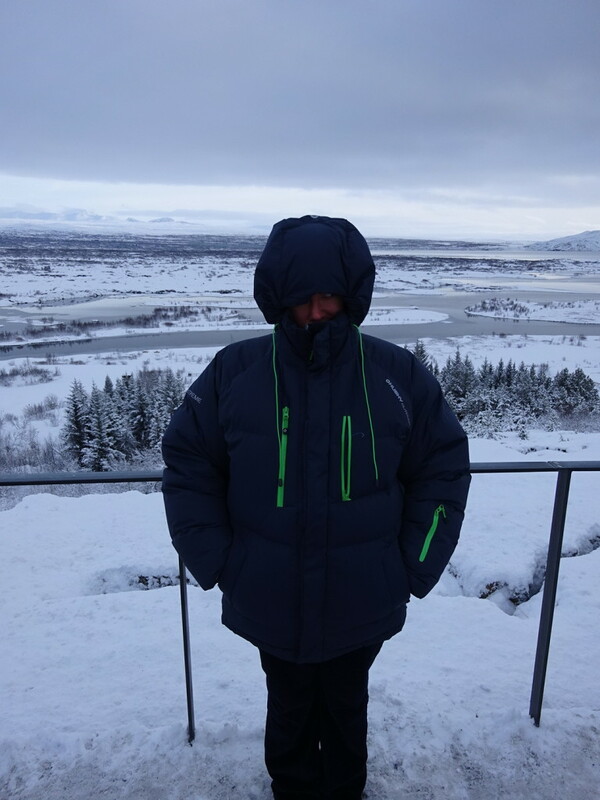 Ok……THINGVELLIR……have to comment now that it’s in your post for second time……. When I first read it… Thing Vellir….. I thought you were at Dr. Seuss birthplace……maybe where THING ONE and THING TWO were conceived? Maybe a great new story there……. Funny bout the old grumpy folks on the bus……must have been a detour to Arizona!! Aw, sorry Aaron got sick. You guys still packed more into the trip than most people would have! Oh, but there’s always so much more we want to do! I think you have caught another kind of bug – the traveling bug. Hope you never recover! Your Iceland photos make me want to go there really a lot even if I have to take a tour on the big bus (minus grumpy old people, thanks very much). Gotta to see the place where the plates separate, and the waterfalls, and the volcanoes and the hot springs, and the small horses and…you get the idea. I think you can safely say we’ve caught that bug permanently. Yep, we’re ready whenever the next opportunity arises! 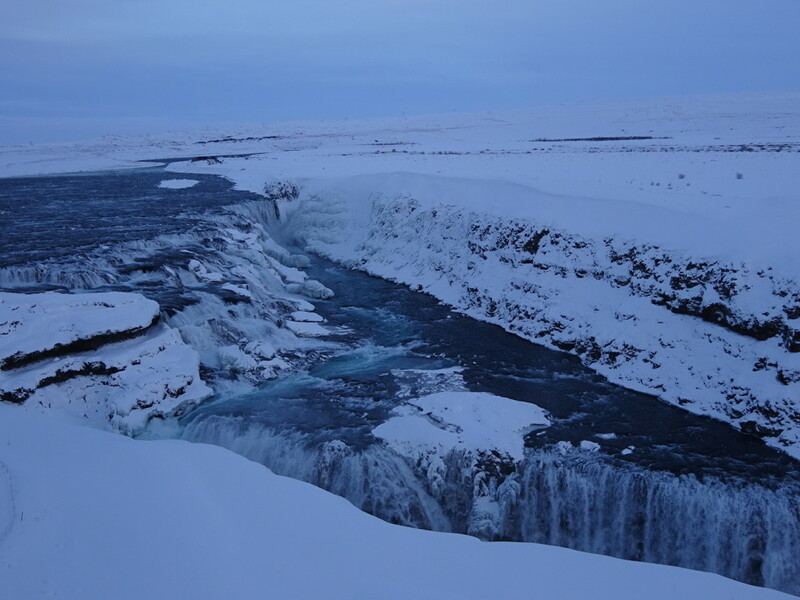 You’ll love Iceland – we certainly did and we’ll definitely be back…hopefully without the sickness next time as we really want to see the magical light in the ice caves along the Southern coast.